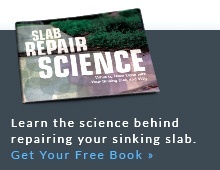 Slab jacking using polyurethane foam injection has been “road tested” for years -- literally. The Department of Transportation has been using this method to stabilize bridge approaches, street intersections, and airport runways for decades. Now, available for residential applications, it can save homeowners thousands of dollars and endless frustration associated with older, inferior methods. PolyLevel® technicians can provide professional services for homeowners needing poly-jacking. Contact your local dealer to schedule a free estimate! 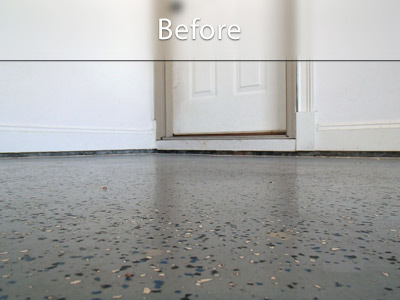 PolyLevel® takes the mess out of concrete leveling. A self-contained unit, such as a truck or trailer pulls up in front of your home. 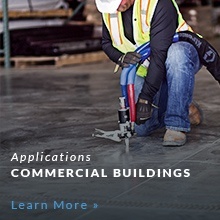 The crew – typically one or two installers – decides where to drill the injection holes. The borings are only 5/8 in. diameter, so they are easily patched and unobtrusive – especially when compared to the hole sizes required for traditional mudjacking. Injection ports are inserted into the bored holes to allow the attachment of the injection gun. Next, the “crew” pulls a hose to the job site from the truck. Inside the truck, a generator, pump, and heater deliver a two-part polyurethane that’s formulated for aggressive expansion. Heated to maintain flow, the parts are not mixed until they reach the tip of the injection gun. As the polyurethane is injected beneath the slab, it quickly expands to 25 to 35 times its original volume. The technician injects the foam in bursts to prevent over-lifting. When the lifting action ceases, he delivers another burst of foam. This is repeated until the desired level is reached. Unlike mudjacking, where the mud injection forms a cone under the slab (point up), the polyurethane injection expands permeating all voids to create a supporting pillow. This eliminates stress points and lowers the possibility of unwanted cracking. It also reduces the number of unsightly borings. When the lift is completed, the ejection gun is removed. Unused polyurethane stays inside the hose where it can be used for the next job. Injection ports are removed, and the holes are filled with cement and troweled smooth. PolyLevel® is the new and effective concrete leveling application that can help lift and level sunken concrete slabs for residential areas as well as commercial applications. 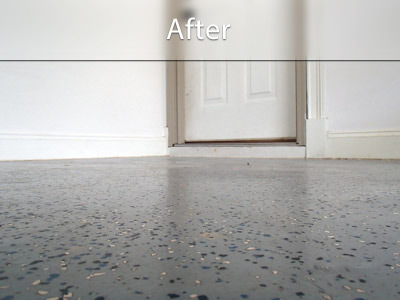 PolyLevel® can fix interior floors slabs, exterior concrete cracks, damaged concrete on patios and stoops, and more. If you have damaged concrete slab that is in need of repair, contact a local PolyLevel® dealer near you for a Free Estimate!